Art is most stirring for me when it represents aspects of my identity. 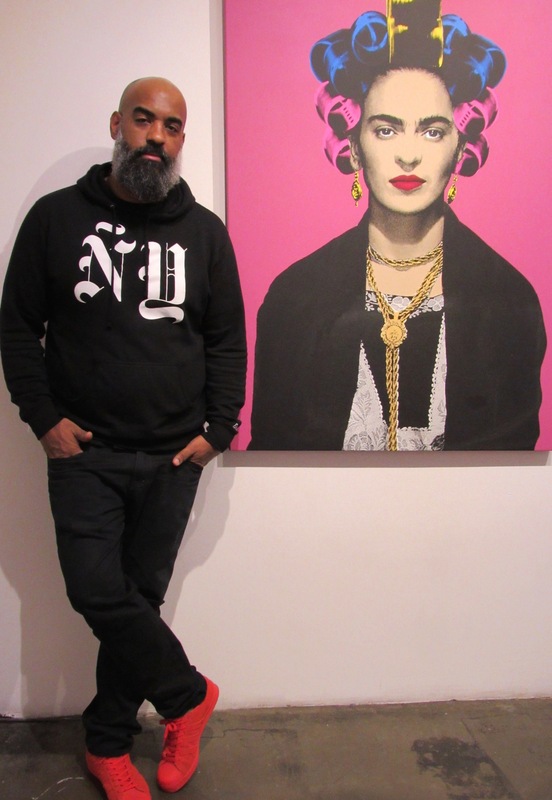 With its fusion of New York City and the Dominican Republic, M. Tony Peralta’s art does just that. Peralta was born in the Washington Heights neighborhood of New York to Dominican immigrants. His mother, Alsacia Ramirez, raised him. Peralta describes her as a true “Dominican Catholic”: she was religious, had an altar and knew every saint’s name. (Peralta himself was named after St. Anthony.) Peralta also grew up during the golden age of hip-hop in New York, a time often described as hip-hop’s zenith. The influence of both his upbringing and the hip-hop culture that surrounded him is most evident in the Peralta Project, a lifestyle brand created by the artist in 2005. Products at the Project range from black-and-white T-shirts with common Dominican phrases, like “Dimelo!” or “primo,” to colorful, 16-inch screens featuring cans of Café Bustelo or Goya Beans. Along with the Project, Peralta has debuted other exhibits, including 2011’s “Complejo” series (Spanish for “complex”). The exhibit focuses on the anti-blackness in many Hispanic and Latino communities. Within Dominican culture, for example, certain characteristics—fairer skin, straighter hair and lighter eyes—are often hailed as superior. When an individual does not embody these features, she often feels conflicted because she does not embody the “norm,” which therefore leads to the development of a complejo. Peralta captures this perfectly in the “Barbie” print. It features two Barbie dolls, one white, labeled “Barbie linda” (pretty Barbie), the other black, labelled “Barbie fea” (ugly Barbie). Growing up, Peralta faced his own insecurities because of his dark skin and curly hair, insecurities that led to low self-esteem. While his own experiences were the influence for “Complejo,” he realized that whatever self-doubt he felt as a Hispanic or Latino man, “women deal with a lot more than I do.” This led to Peralta’s latest exhibit: “Rolos & Icons.” I visited Mr. Peralta during this showcase and spoke with him about the inspiration behind his work. Whether oppressive or empowering, rolos are symbols that represent women. In Peralta’s exhibit, we see famous Latinas using a traditional practice familiar to many of us. We see Celia Cruz against a purple canvas; Doña Florinda in her iconic stance, hands against her face, smiling; La Lupe wearing a red dress against a red backdrop; and Dora the Explorer with her iconic backpack in tow—all in rolos. All these women are, even if only for a moment on canvas, just like us. It has taken me almost 26 years to realize that my curly hair does not mean I am less professional, less respectable or less intelligent than my peers. It has taken me almost 26 years to get over my own complejo. As I stood in the audience at the “Rolos & Icons” exhibit, I realized just how deeply ingrained this mentality is in my culture and my people. And I realized that we were all there for the very reason Peralta wanted us there: We saw ourselves in his art. As people of color, we often feel strikingly thrown against a white-washed world, and that is what we saw in Peralta’s work. We saw ourselves in the bright, Andy Warhol-esque pictures of Selena Quintanilla-Pérez or Celia Cruz on the whitewashed gallery walls. Most important, we saw ourselves, our experiences, insecurities and complejos in Peralta. This article also appeared in print, under the headline "My Identity, Complex ," in the February 8, 2016 issue. Olga Segura is an associate editor of America.